The first quarter of this culinary journey is complete! The last two weeks of class garnered some of the easier, every day breads and treats. In week nine, we made challah bread, fougasse and baguettes. We also snuck in an ice cream treat because the ice cream kitchen was finally available. I’m still enjoying my pistachio white chocolate ice cream – I actually can’t believe I still have some left. The last 2 classes focused on how to use leftover ingredients – namely, an extra challah loaf and baguette we left behind from the week before. We turned them in to an amazing chocolate bread pudding and croutons, respectively. We also squeezed out some toffee, brittle and pretzels, which just like all the breads before it, was laborious, but worth the effort. On the very last night of class, I had my very first total recipe failure. We were making truffles and I over-poured the cherry liquor and my ganache never set up enough to roll into truffles. Lesson learned, when the chef says not to use more than 1.5 ounces of liquor and you accidentally pour 1.8, don’t shrug it off and say “it will be ok”. I actually intended to take a sip to try the liquor on its own, but totally forgot as I started throwing things together. Alas, no truffles for me. But, like any good chef, I can improvise – the cherry-chocolate sauce will be great over my pistachio ice cream! I was much more successful with my toffee and spicy pecan brittle. Both were a hit at the office, I personally like the brittle the best. The past ten weeks have been a blast – I’ve had fun and I learned a TON. I’ve been able to work in a professional kitchen where there are awesome tools like blast chillers, Hobarts that are so big they need to be wheeled out on a cart and had access to a pantry full of goodies to please any palate. 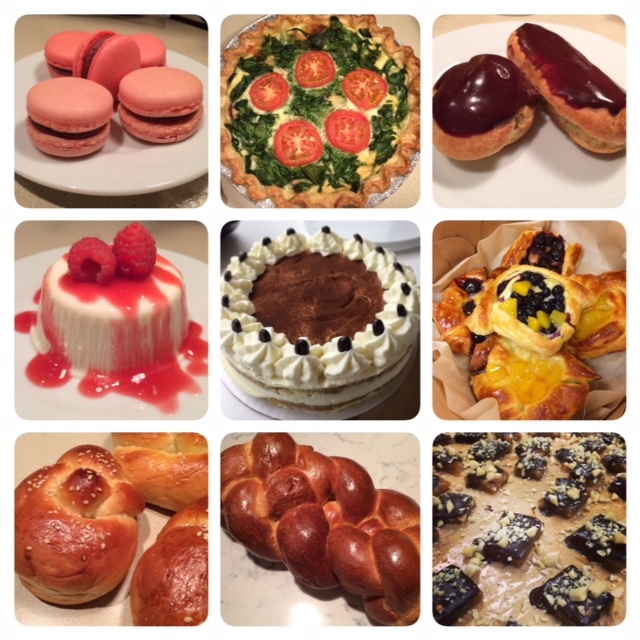 Out of everything I’ve made, a few items stand out as my favorite: tiramisu, French macarons, panna cotta, quiche, and pastry cream which has a million different uses. I have a break for the next three weeks, and when class starts up again, I’ll be going back to basics – knife skills, stocks, sauces and soups. I’ve heard that breaking down a whole fish and boning Cornish hens are on the syllabus – eep!